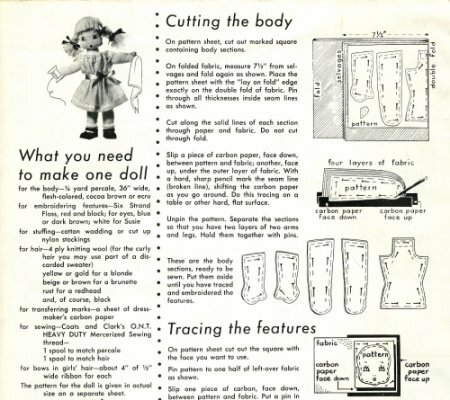 This pattern is copyright 1955 by the Educational Bureau of Coats and Clark, makers of thread and sewing notions. It consists of a 22" x 17" sheet, printed on both sides and folded in quarters, which has the instructions and clothing patterns; and an 11" x 17" sheet which has the body patterns. This pattern was apparently made for school use - it indicates that a teacher's file copy is available free upon request, and the pattern leaflets are 5 cents each or 25 for a dollar. The description on the cover reads, "Take your choice from this most adorable of sextets and see what Mother's scrapbag will yield for his, her, or their outfits." 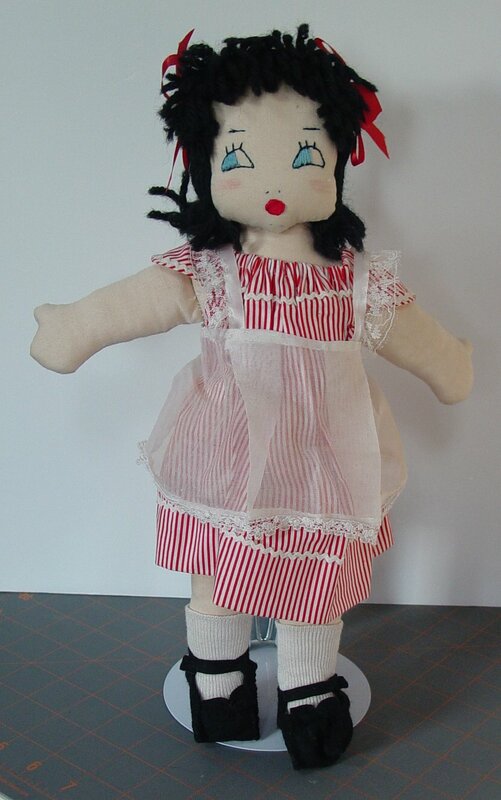 The dolls make up at 14" tall and are separated pancake style. 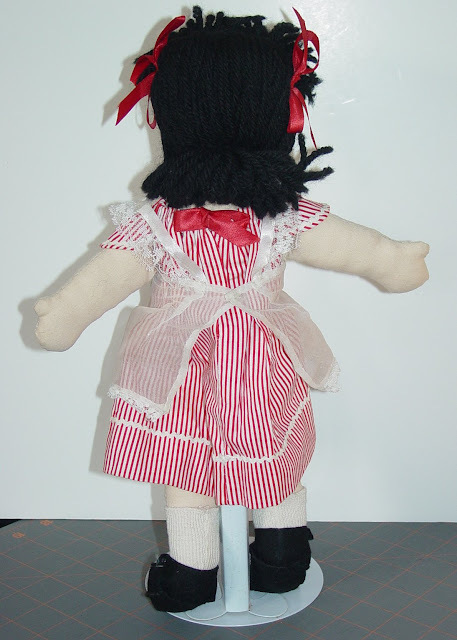 The neck is sewn to the back of the head to give the doll a chin. They have mitten hands, embroidered features and yarn hair. 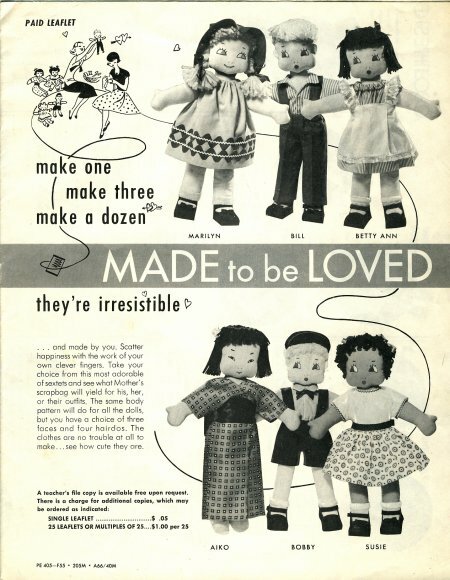 All six dolls are made from the same pattern. The maker has a choice of three different faces to embroider, with three different girls' hairstyles, and one boys' hairstyle. This pattern has very detailed instructions with lots of clear illustrations - excellent for a beginner. The clothing patterns include underwear, two hats, and shoes to be made from felt. Socks are to be purchased. All outfits are made to be removable. Betty Ann, pictured below, was made by Caroline Snow of Warner, NH in 1966. 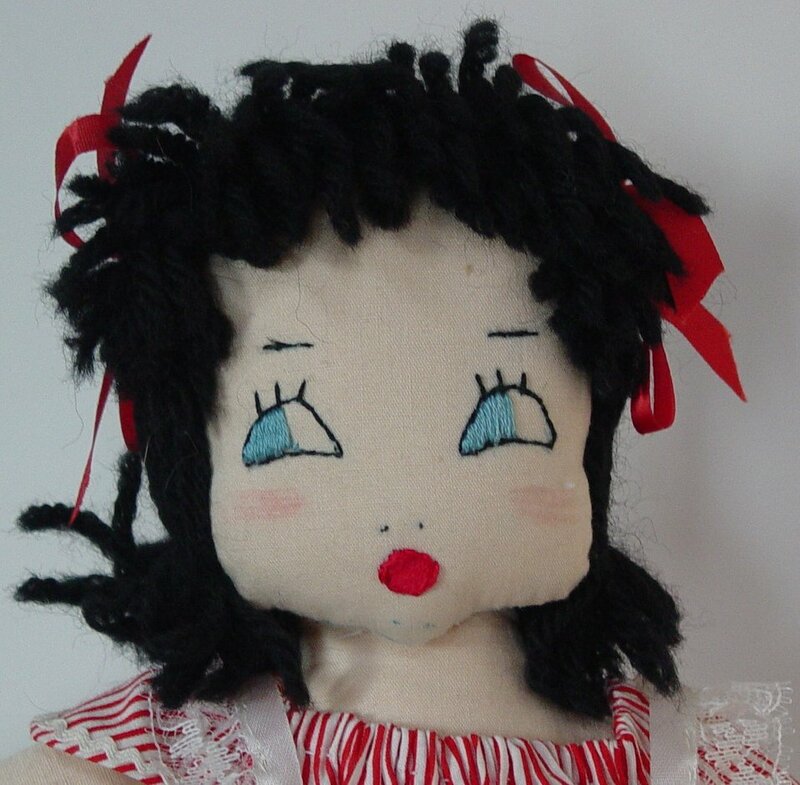 She is one of my favorite dolls. Is there a way to get a copy of the pattern? She is way cute. You can find them here on eBay.